I'm sorry I wasn't able to update last week. It's been busy around here. I have had the chance to work with Ashley a couple of times. She contacted me recently and wanted to do a session for her birthday and to celebrate reaching a weight loss goal. 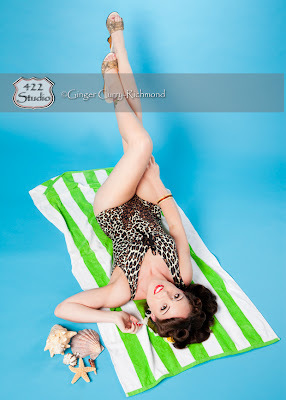 Both of which are excellent reasons to treat yourself to a pinup session. She is looking fantastic, I mean look at those legs! She looked great before and now she is looking even healthier and more toned than before. Congrats Ashley! She elected to do a beach theme. This vintage swimsuit fit like it was made just for her. I'm glad I got a chance to work with her again.